The BM-800 comes in a variety of color choices and I chose blue and silver. 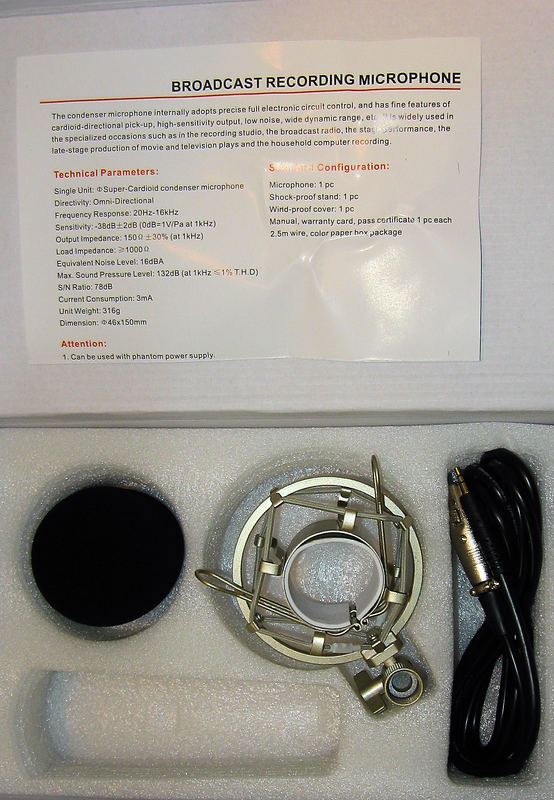 On the inside it's an electret condenser microphone requiring a separate power source (phantom power) to operate. In testing with my FT-817 it was operating on only 5VDC. Obviously the gain was reduced at 5V in but I was still able to adjust the output to match the level from the dynamic hand microphone for my FT-817. The G4IZH modification converts the output to unbalanced and tailors the frequency response for better performance with an amateur transceiver. It's probably not going to beat out an expensive, high-end amateur microphone, but then I wasn't willing to pay the high-end price either. And I prefer DIY projects whenever possible - for me that's what the hobby is about. Although these mics are inexpensive, they are still well constructed. The shell and frame are all metal and only the internal electret mount is made of plastic. It's easy to disassemble the BM-800 - just unscrew the end and the metal shell slips right off. Then there are two screws inside that hold the screen in place. And there's plenty of room inside for the conversion. There is one circuit board in this mic. Some of these have or had a second unused blank PCB mounted on the opposite side but not this one. The screen removed to expose the microphone element/holder. The screen now has a foam insert unlike older BM-800's I've seen online. 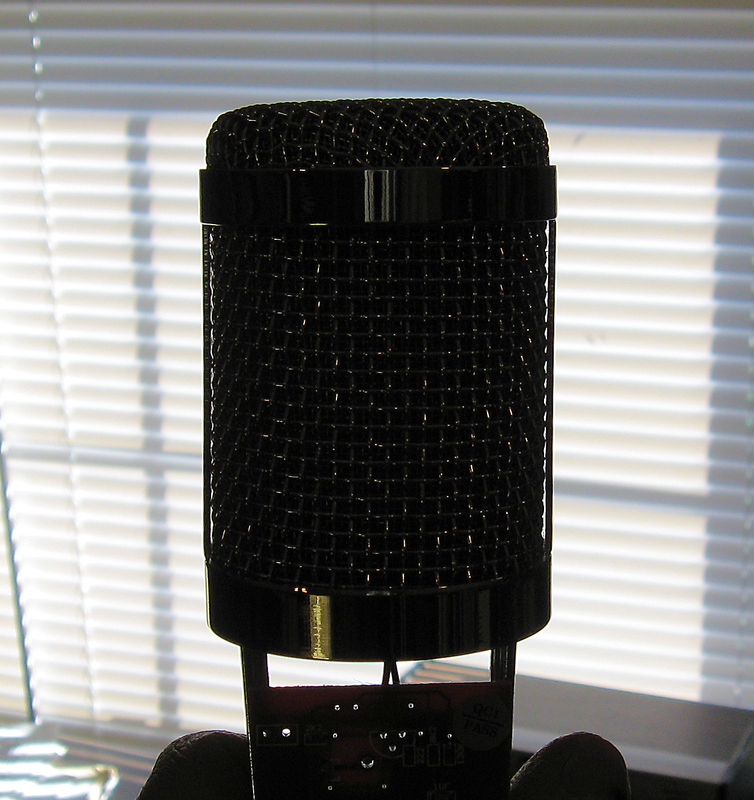 Thanks to the foam insert, the internal microphone element is not visible through the screen even when backlit, unlike older versions where the element was easily seen. Shouldn't be any need to add the external wind cap. Also, the front of the mic element faces the lettering on the body. Besides the foam cap, the accessories include a metal shock mount and 2-wire microphone cable. The shock mount works fine as is, but the original conversion circuit required a 3-wire mic cable because it uses a separate lead for power. My FT-817 Windcamp interface puts phantom power on the audio lead, so I altered the mic circuit to use phantom power too, eliminating the need for a third wire. Now I can use the supplied 2-wire mic cable along with my Windcamp adapter. 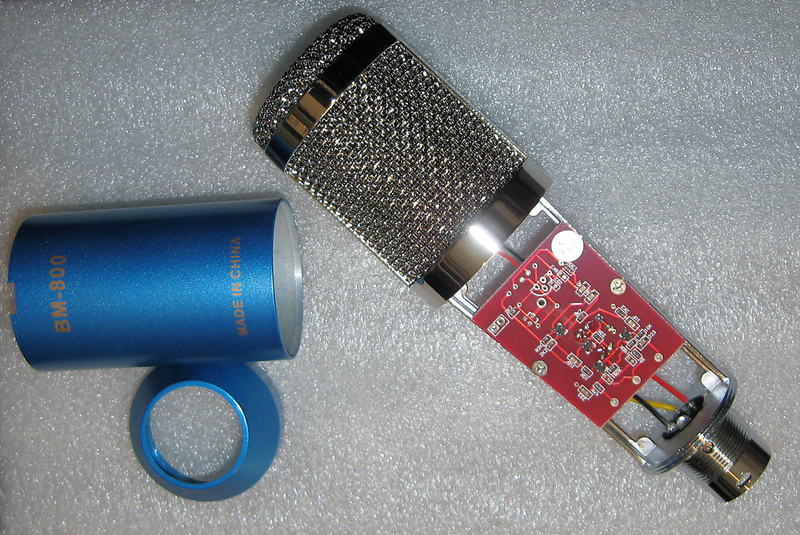 This mic has a different electret module than the one shown on G4IZH's site. 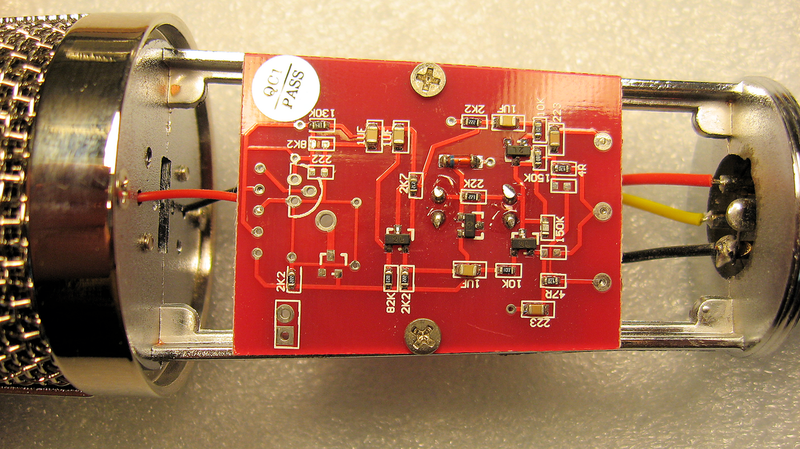 This one is smaller and has the FET built into the module hence there is no FET on the PCB. 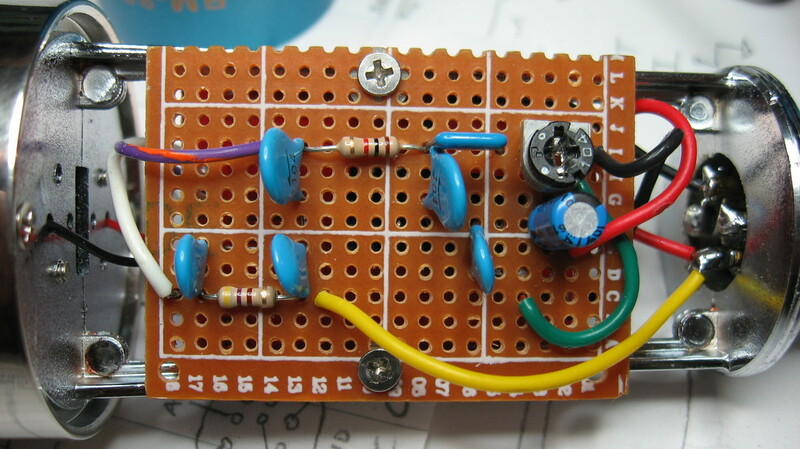 The only components on the back of the PCB are two 47uF electrolytic capacitors. The caps stick up about level with the frame and I added washers under the add-in board mounting holes to space it up a little higher so nothing shorted to the top of the caps. Or just avoid the area of the caps on the add-in PCB. 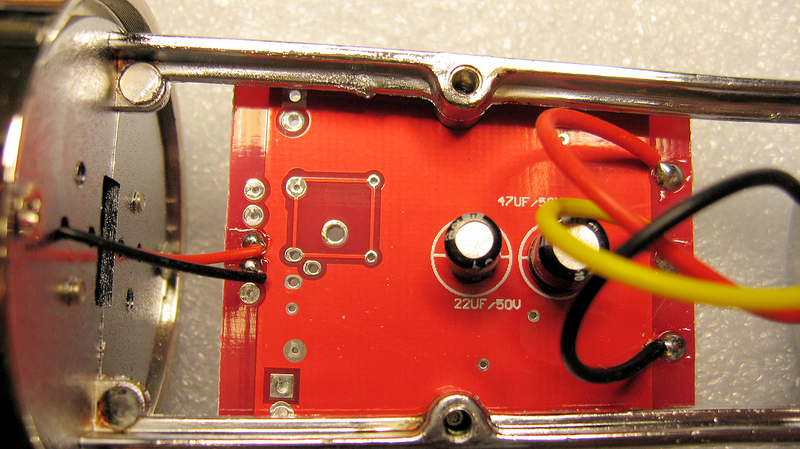 A closeup of the PCB gives a better look at the traces and components. The red and black wires for the mic element connect on the left and the XLR wires on the right. The mods to the PCB and connections to the add-in board. The blue cap is the 2.2uF across R4. 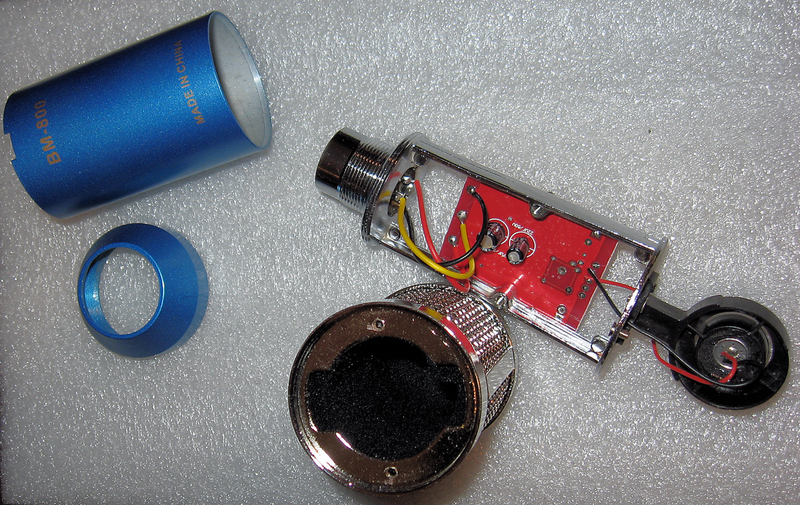 The violet wire picks off the audio from Q5, sending it to the input of the Lo and Hi audio filters. The PCB traces from C5 to the collectors of both Q1 and Q2 were cut to remove them completely from the circuit. The white wire from the power filter connects at C5. Also, C3 and C4 were removed. 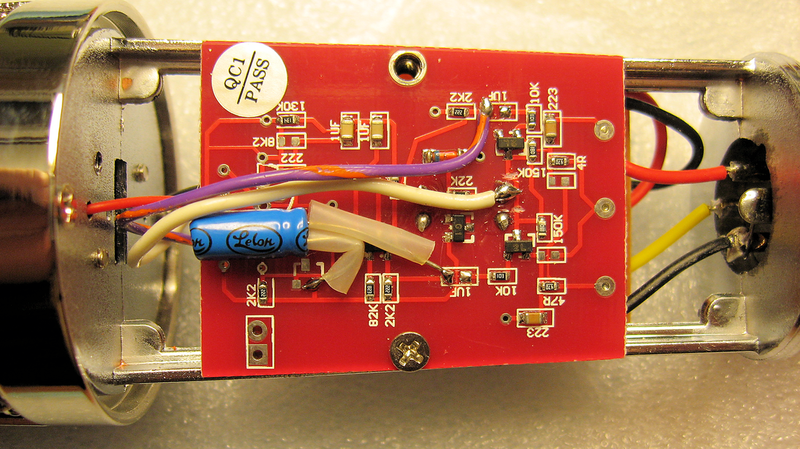 The add-in PCB has the capacitors and resistors for the power and audio filters, and the VR1 audio out level adjustment. Using an o'scope I adjusted VR-1 to provide the same level out as my hand mic. I modified the original mod, adding phantom power on the audio lead, by removing the yellow power wire from pin 3 and connecting it to the red audio wire on pin 2. Then a 4.7uF capacitor was added between the red wire and the wiper on VR1, to block DC voltage from getting to the potentiometer. 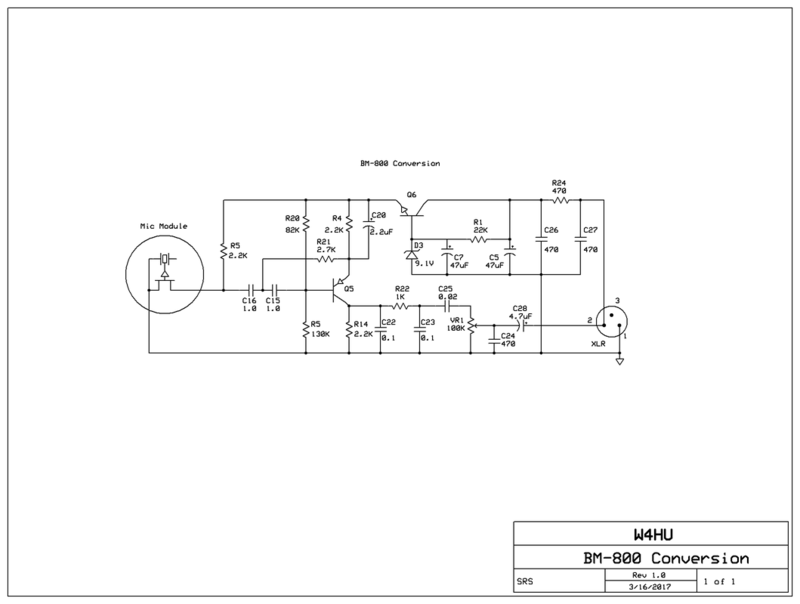 Schematic with the component values in my converted BM-800. 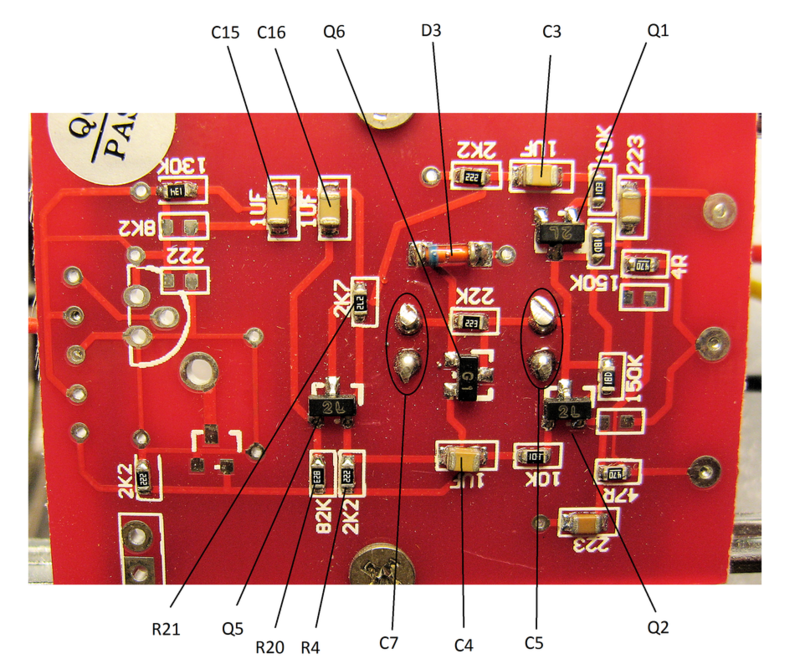 A few of the part values in my mic circuit vary from the G4IZH schematic. 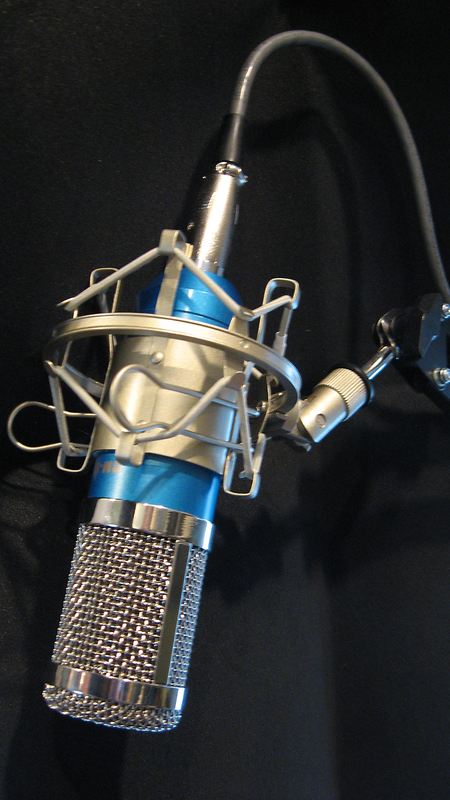 The converted microphone mounted on a scissor boom arm using the included metal shock mount. Not bad for less than thirty dollars including the scissor arm.